News — Bloom Biological Inc. Updates on BBI's current projects and news that relates to BBI's goals and interests. From LA to OC, burrowing owls are attempting a comeback in Southern California. “With the help of the world specialist of Golden Eagles, Dr. Peter Bloom, who traveled especially from California, Golden Eagles will be captured and equipped with GPS tags to track their every move. The data collected will be used to better define implantation sites of any future wind farms in the Alps, in order to avoid the risk of bird collisions with blades. In order to preserve our climate, the transition to an economy based on renewable resources is a necessity. Some ‘green’ electricity modes of production however, can cause increased biodiversity risks. Birds and bats pay the price when they collide with the blades of wind turbines. The construction of wind farms in the Alpine region poses a potential threat to the fauna of the area, in particular for large birds such as Golden Eagles or Bearded Vultures. Both species are long-lived and have a low rate of reproduction, any loss could have dramatic repercussions for the future of their populations. The reintroduction program of Bearded Vultures in the Alps is considered one of the world’s most successful reintroduction programs. It would be tragic if green energy destroyed this success, taking a toll on these magnificent birds of prey, especially as they provide a first-class health service in our mountains. For this reason, the siting of future wind farms in the Alpine area must be planned very carefully. The topographical areas where large birds of prey are more frequent will have to be avoided. To be able to clearly define these zones, researchers at the University of Bern want a spatial usage map to work out a kind of ‘3D model’ of the airspace, from the ground up to about 200m height, at which it is possible to see exactly the areas most used by the birds (e.g., mountain ridges with thermally favorable conditions, etc.). The intention is to prevent wind turbines from being built there. The first uses high-performance binoculars that can view a bird in the sky and get precise coordinates of its geolocation (latitude, longitude and altitude). These field surveys began throughout the canton in April 2018 and will continue until the end of March 2019. 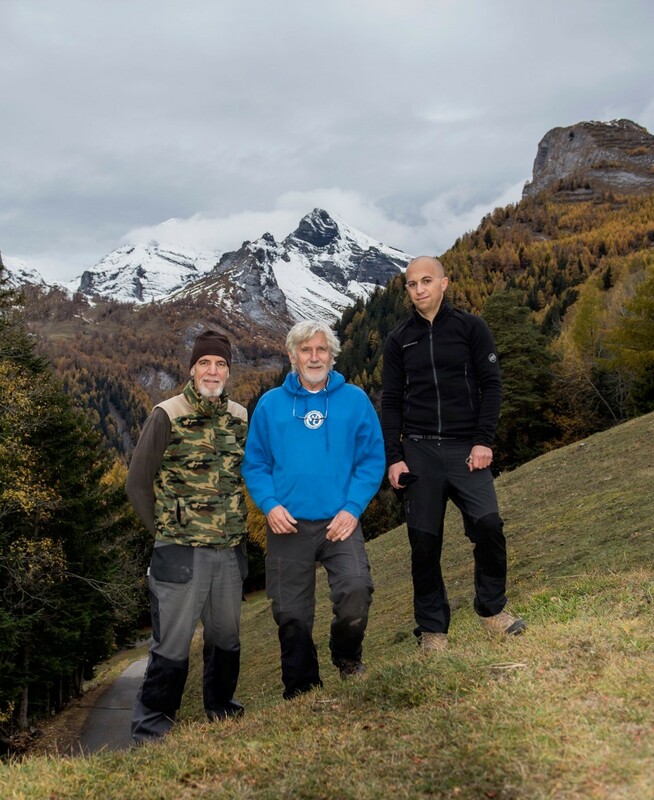 From left to right: Stéphane Mettaz (field technician University of Bern), Dr. Peter Bloom, Ron Milgalter (doctoral student at the University of Bern). 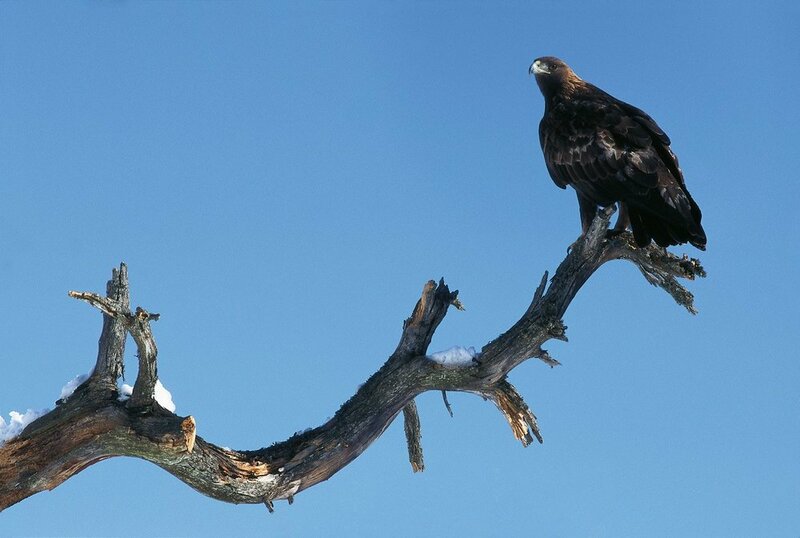 A Golden Eagle photographed above Conthey (copyright R. Arlettaz). BBI was invited out to Big Bear lake to band the Bald eagle chicks this year before they fledged. Check out the video! Bloom Biological, Inc. is currently looking for qualified biologists interested in on call opportunities specializing in nesting bird surveys and raptor monitoring throughout Southern California. Applicants should have significant and demonstrable birding skills and familiarity with sensitive species. B.S. or master’s degree in biology preferred. Must be able to work independently and interact positively with project managers, clients, landowners, and other technicians. Candidates with prior experience conducting nesting bird and raptor surveys will be given preference. Work requires the ability to identify bird species present in the western U.S. in general and southern California/Nevada desert species specifically, by sight and sound, sometimes at great distances. Must be able to take detailed field notes, collect behavioral and spatial use data according to established protocols, and fulfil daily reporting requirements. Skilled use of topographic maps, GPS units, and other standard field equipment is required. Work opportunities are available immediately and given preferentially to those who respond quickly to emails or phone calls. Hourly rate will depend on experience. Those applying MUST possess the following: Demonstrable birding skills including raptor ID and survey experience. A Valid Driver’s License is required and experience driving a 4 wheel vehicle is preferred. For the past several years we have had the opportunity of hosting an externship with students from Tufts University studying conservation medicine. Generally we host them over their winter break, where they spend time in the field with senior biologist Peter Bloom learning trapping and handling techniques with a variety of raptors. Here are a few great photos from days out in the field. 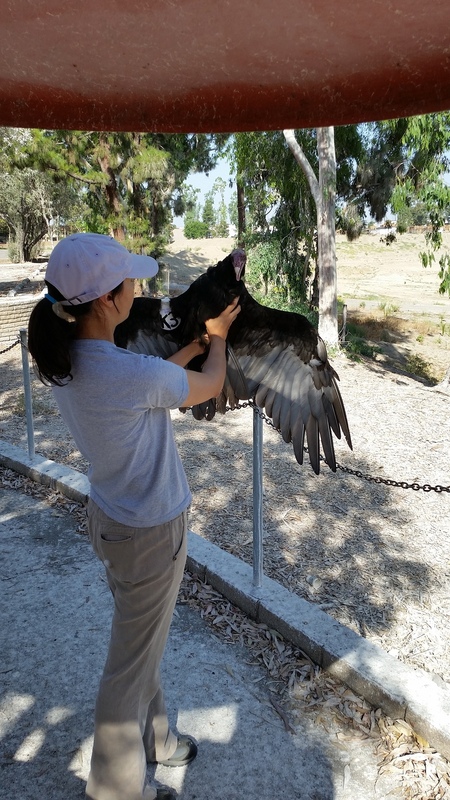 Pictured is this years amazing extern Cristen Mathews with a Golden eagle and Red-tailed hawk. If you are interested in an internship, contact us through our website. We value sharing our expertise and mentoring the next generation of biologists, veterinarians and conservationists. Bloom Biological Inc. is an environmental consulting firm with over 40 years of experience with endangered and sensitive species in California. We are currently looking for an efficient and focused person to work in the main office assisting the president and CEO with administrative tasks and helping the accounting department with basic clerical duties. This is a great opportunity for any budding ornithologist or avian enthusiast with an interest in raptor research and Southern California. Aside from basic clerical duties there will be a heavy influence on maintaining field records, databases and 40 years of data sets on raptors. Organizing all correspondences that come into the main office including emails, phone calls and mail. Making reservations and managing administrative tasks for the main biologist. Examples Include conference registrations, field access forms, airlines and hotels. Filing project papers and archiving historical field data to maintain an organized and efficient office. Locating research, historical papers and data as needed for publications. Managing upkeep of all computers and devices including backups and system upgrades. Preparing and maintaining the main office for meetings and ordering necessary supplies. Experience in biology and conservation a plus. Strong proficiency in Office 365 (Excel, Outlook, SharePoint, and Word.) QuickBooks knowledge a plus. Familiarity with both PC’s and Mac’s. Able to problem solve simple tech issues. Consistent attention to detail and organization. Self-motivated and adept at working without constant direction. Ability to prioritize tasks during busy periods in the office. Ability to be decisive and resolve simple issues that will allow the president and CEO to focus on major projects. Flexibility with schedule and the capacity to manage time efficiently. What a year!~ 2017 has been quite a year with lots of ups and plenty of downs, but we wanted to take this opportunity to thank everyone we had the opportunity to work with this year, and wish everyone a great 2018. We have the unique opportunity of being able to work on projects large and small, providing the personal touch of a small company with the organizational skills and knowledge of a larger firm. We had some exciting projects this year that allowed us to get into the field and provide the scientific expertise we are known for. At BBI, one of our core values is staying abreast of the latest research and contributing regularly to scientific advancement. Solar Energy and Nesting Swainson’s Hawks in California’s Antelope Valley: How Long of a Future Together? As a women owned business it is important to support and provide opportunities to the women on our team. Ashley Macomber has been working with us for a while on a smaller scale, but will be moving into the position of Assistant Project Manager providing our team and our clients with organization and clarity, ensuring a smooth workflow. Jackie Catino-Davenport continues to be an integral part of our team. Ms. Catino-Davenport has stepped into the role as part owner of BBI being able to manage large teams of people on several of our projects and creating great customer relationships. Her experience in the field combined with her understanding of protocols and her precision in communication make her an incredible asset to our team. Breanna Bartels, has become the head of the accounting department this year making sure our clients and our staff have everything they need to start, conduct and finish any project. Having worked with BBI for five years now, she is not only an expert at accounting, but she possesses the knowledge to understand the needs of our field biologists and can translate that into numbers. As a small business, each person on our team must wear multiple hats. We are a small team, devoted to our success as a whole and to each other individually. We are proud of the work we have done, and our abilities to provide excellent consulting and research that promotes conservation and considers the changing landscape of our time. We look forward to the challenges of 2018, and wish everyone a joyous and productive new year. ~ Rebecca, Pete, Breanna, Mike, Jackie, Ashley, Kerry and Bob. BBI's Peter Bloom was recently featured in an article from the Wall Street Journal, examining the role of roadkill in biology and conservation efforts. There is a video as well, where Pete uses part of a musk deer to trap Turkey Vultures in an ongoing study effort to determine why their numbers have been "dwindling". Allen Fish and the folks at the Golden Gate Raptor observatory just sent us this link to Pete's talk from the 49th Raptor Research Foundation conference hosted at the Golden Gate Raptor Observatory in November of last year. Pete's presentation "Fifty Years of California Raptor Conservation — Success, Failure, Works in Progress, & Insights for Future Research" was wonderfully filmed and we are delighted to be able to share it! 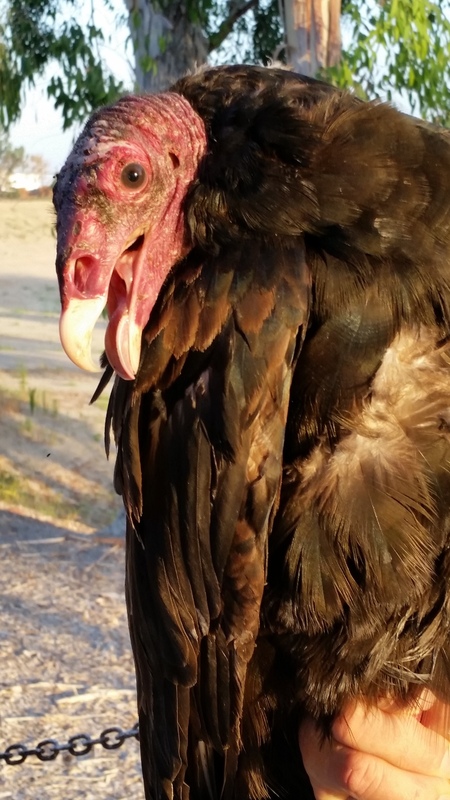 Here are photos of Turkey vulture trapping this past week with Jackie Catino and Peter Bloom. California High Speed Rail Authority just published their small business newsletter featuring a nice article about BBI's involvement in the project. We are currently out in the field surveying for Swainson's hawks, a threatened species in CA. Biologist Jackie Catino shared photos from her recent trip to Thailand, where she captured many wonderful species. This Great Horned owl was photographed out in Kern County this week near the Cattani Ranch by BBI biologist Michael Kuehn. Spring is a busy time of year at BBI and we are currently in the field all over California and parts of Nevada. Happy holidays and best wishes for a wonderful new year! We are pleased to have accomplished so much this year, and value the relationships with our clients and collaborators. We wish everyone a successful and productive 2016! While home visiting family last week, Dr. Michael Kuehn and fiancee Jean Galang spotted a very rare young Scissor-tailed Flycatcher off course during its first migration. See pics and read all about it on the Michigan Audubon site. Peterson Ranch has established the Land Veritas Mitigation Banks which will provide habitat for a number of important species. We were relatively peripheral to the creation of this land bank but our endorsement of it as credible Swainson’s Hawk habitat contributed to its acceptance.